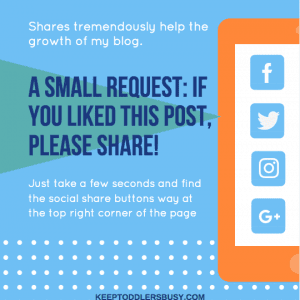 One reason why I love social media is because I get to be inspired by so many great ideas everyday regarding preschool sensory activities 🙂 And my children benefit from it! 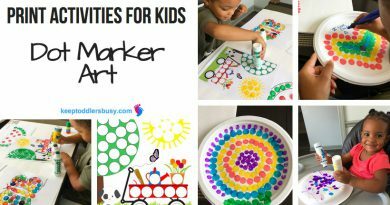 I was super excited to try this easy activity and the kids really enjoyed it, over and over again. It was low prep and low on the mess meter, which is always a great thing. I know it’s technically Fall, but it is still hot where I am! This a great kid’s project for the heat, great for learning colors, and just having some sensory fun. Enjoy! Thanks @learningwithlottie for a great idea! It’s nice to allow your frozen pom poms to melt outside, but when this is not an option, I just throw down a blanket in their play area and let them have at it. 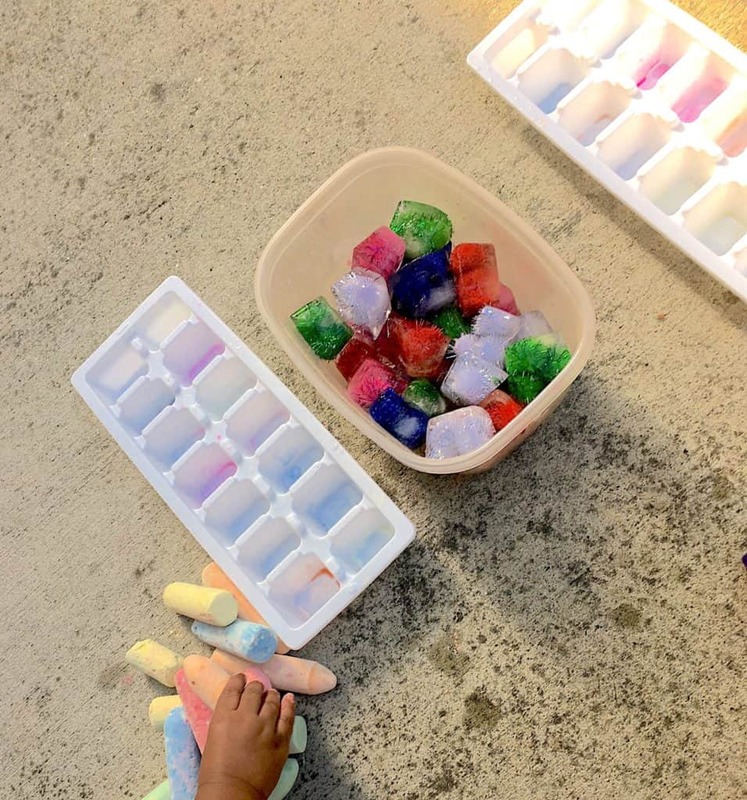 My preschool aged son practices counting with the frozen cubes while my 18month old toddler is doing sensory play and reciting colors with the same cubes. So simple yet so fun! If you want more great activities, check out my post on other pom pom arts and crafts and also my post on popsicle crafts and dot marker art! Check out more simple sensory activities for children below! 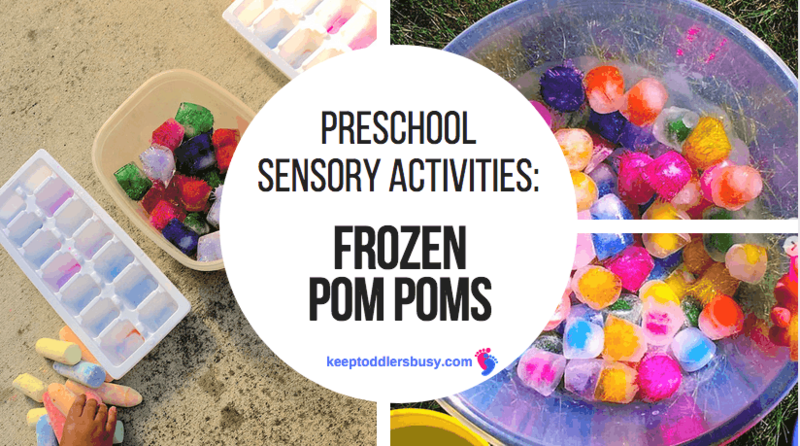 For even more fun, check out one of my fav blog mom’s post on sensory activities for toddlers and preschoolers as well! 31 days of activities. Well I hope you enjoyed these crafts! They have certainly brought joy to my children, and I’m not just saying that 🙂 Please tell me some of your ideas below. 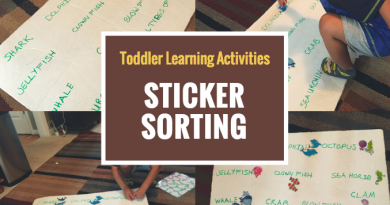 I would absolutely LOVE to hear about them and also hear if your child enjoyed this craft! Did the pompoms dry out and would you use the same ones again? I wondered about other things that could go into ice cubes – googly eyes etc. But then I started to wonder about the health and safety aspects. Did your children put the ice cubes in their mouths? Was there a danger of swallowing the pompoms? What precautions did you take to make sure this didn’t happen? The pom poms do dry out and I use them over and over again. My kids are past the age of putting everything in their mouth (thank goodness) but giving them something to play with the cubes probably makes it easier. I have plans to put all types of things in these ice cubes! lol. These look fun (and cold) enough for adults, too, to cool off a hot day. I really like that picture of your daughter holding the ladle. Such a fun age of discovery. It’s good to have these kinds of activities for siblings to do together to keep them getting along. Cool video – The gardening and oats look like super fun. Now that’s easy. For me, the highlight of this activity is more of the ice itself actually. You see, my niece is very afraid of ice – the sight of it and the touch of it scares her. I don’t know what kind of phobia she has with ice, but she surely don’t fancy them. She’s only three. I wonder how’s her reaction would be like if I were to add poms-poms into them. Good idea to try out. Let me know if it makes a difference! Hello Keyla , i enjoyed your post on Pom poms. I have a dream to start my kindergarten and i hope my dream will come true. with pom poms kid can learn many things using senses but i have a question, what if the kid explore tasting activity,is there any effect to theirs health? If there is then some precautions must be taken. Thank you, your website has inspiring content. I would watch out for it, but it did not seem to be an issue for me!